A year-long study will assess the impact of more than one million tourists a year on the Antrim coast. It was commissioned by the National Trust, which manages two main sites that attracted 1.5m visitors in 2019. With the projected growth in tourism, the trust says numbers visiting the Giant's Causeway and Carrick-a-Rede rope bridge are expected to grow. Its NI director said it was the first time a World Heritage Site had done work like this. Heather MacLachlan said the survey would focus on "examining physical spaces, the environment, how visitors feel about their visits to these places and how we can work as good neighbours." The work, lasting between 12 and 18 months, will focus on the opportunities as well as the impact of tourism. The public has been invited to attend a drop-in event at the Causeway Hotel on 9 May to find out more. People will be asked to collaborate to come up with a sustainable future for the region. 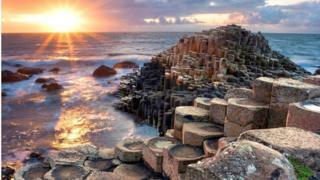 The Giant's Causeway and the success of the Game of Thrones television series have driven tourists in huge numbers to the area. But it can lead to sustainability issues. The Dark Hedges - a tree-lined road made popular by Game of Thrones - suffered due to the number of people parking along it before restrictions were introduced.